The survival of the U.S. Postal Service depends on Congress giving it the latitude to  cut its costs by $20 billion, Postmaster General Patrick Donahoe said at a Nov. 21 National Press Club luncheon. Donahoe said the system "lost more than $5 billion" in the most recent fiscal year and could go broke without congressional action. He said the organization needs to achieve $20 billion in savings by 2015, a move that would require closing as many as 3,500 low-perfoming post offices and possibly ending Saturday delivery. Although he expressed gratitude for what he calls strong congressional engagement on Postal Service issues, Donahoe was not optimistic about two bills that have been introduced. "Unfortunately, both bills have elements that delay tough decisions and impose greater constraints on our business model," he said. "Taken as they are, they do not come close to enabling cost reductions of $20 billion by 2015 -- which they must do for the Postal Service to return to profitability." 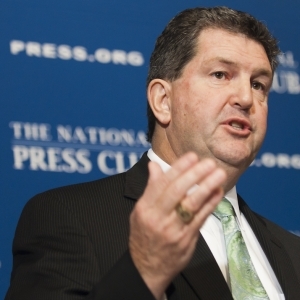 Donahoe, a Pittsburgh native who became the nation's 73rd Postmaster General on October 25, 2010, said that a solution could be reached but left no doubt that the pending legislation must be significantly revised to give the Postal Service the flexibility it requires to cut costs. He emphasized that the Postal Service "is not supported by taxes. We must persuade people to buy our services against tough competititon." For instance, many people who once paid bills via mail now do so online. Such payments account for 7 percent of the annual reduction in bill payments by mail, he said. Even though the Postal Service still handles almost half of the world's mail, some post offices have been closed already. They are not shuttered without a public hearing. The Postal Service will have to rely more on retail stores to handle postal business, Donahoe said. Some 71,000 stores, such as groceries, provide such services now. People in rural areas are often reluctant to surrender their post offices, Donahoe said. Efforts are made to ensure there is another office or retail outlet with service nearby. Donahoe is a 35-year postal veteran who began as a clerk in Pittsburgh. He worked his way up to chief operating officer, executive vice-president and senior vice president of operations. He received a Bachelor of Science degree from the University of Pittsburgh and a Master of Science degree as a Sloan Fellow at the Massachusetts Institute of Technology. He reports to the Postal Service Board of Governors.